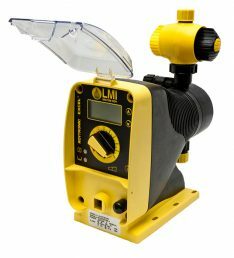 LMI ROYTRONIC EXCEL™ Series AD Pumps are the Digital Series of positive displacement, Liquifram™ chemical metering pumps with an NEMA 4X/IP-65 enclosure. Relevant model codes are NSF, UL/CUL or CE certified and offer control options and improved electro-magnetics to meet all flow / pressure ratings. Designed for Commercial/ Municipal applications, the pumps are available for applications up to 250 psi with capacities between .001 and 2.0 GPH. Dual manual control options with pulse input and 4-20 mA input are available. LMI standard FastPrime™ Liquid Ends are equipped with a valve that allows for opening the head to atmospheric pressure to assist in pump priming. Standard half-inch NPT connections allow for ease of configuration. Ferrule designed fittings offer secure, leak-proof tubing connections.